I love word games. They're a fantastic way to develop children's literacy skills, while providing the fun of using clues to solve a mystery. I told you about lots of word games in Messing About with Words to Increase Literacy and I invented a real life version of Only Connect in Word Fun at Only Connect. You can find some more of my favourite word games in the Book Chook Bag of Tricks. Here's a new one that might turn your kids into word detectives. 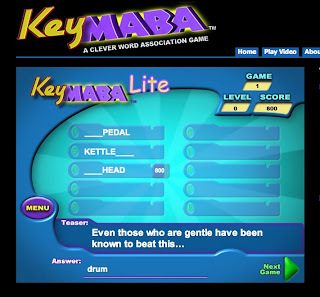 It's called KeyMaba. (I discovered it thanks to Russell Stannard.) It's available for sale as an app, for sale via the website for $1.99 or you can try it for free via the developers, Head Fake Games.com. 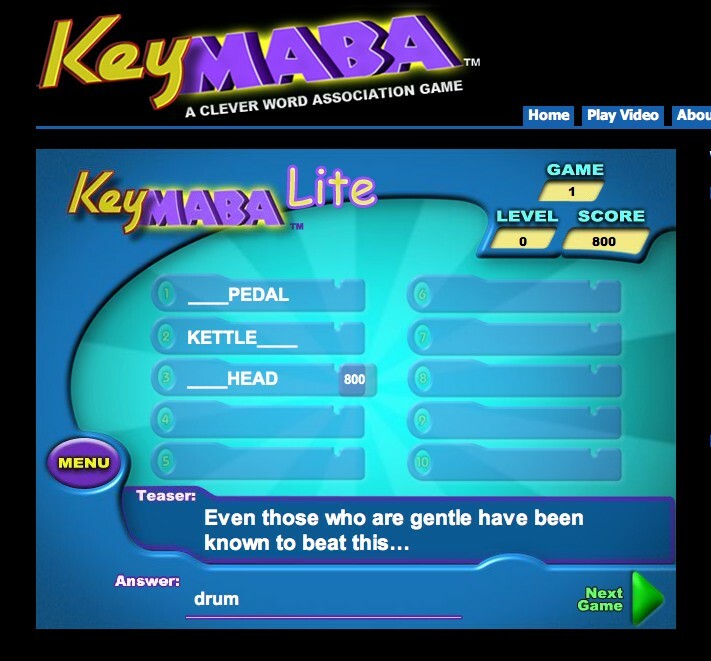 KeyMaba gives you a clue for the word you need to provide, then it gives you examples of compound words, phrases or expressions containing the keyword you're looking for. The more examples you need, the more your final score is reduced. My first clue (teaser) was "many would like to do this to their boss". I thought of "sack him" which speaks volumes about my respect for authority. But my first word clue was Rapid___. Of course, "fire" was the same as sack and "rapid-fire" worked. The second word clue popped up while these thoughts clunked away. It was Rocket___. I quickly typed "fire" on the answer line and received 900 points. The speed makes it probably best for kids over ten in my guess. The game is fun and fast - even if your kids aren't old enough to try it, I think YOU should. Having our children witness us loving word games and reading contributes to their own enthusiasm for literacy, after all! Do you have a favourite word game children might like?